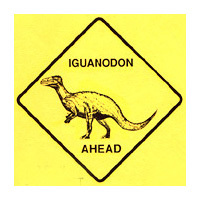 Realistic plastic yellow traffic signs warning of Iguanodon traffic up ahead. Perfect for the bedroom door of a young dinomaniac. Small hole for mounting or light enough to be held with an adhesive.